I chose Brookdale Wilsonville for my husband and it's been a couple of months now. He gets care with showers and any emergencies. It is clean, well-organized and cheerful. The food is good and help when you need it is instant. Everybody smiles. Its a really nice organization. My husband hasn't participated in any activities yet since he's still getting physical, occupational, and mental education. He has a lot of people coming in and helping him to recover. They have bus rides, card games, bingo, people who come in to entertain, and exercise classes. The pricing is expensive, though. I love Brookdale. The food, care, and cleaning are good, and they're very attentive. They communicate well with me and the caregiver who is not on-site. They have a lot of other resources that they help me with, and the people are sweet and kind. My dad's happy there, and it's very reasonable. It was a wonderful place, and we love it. Brookdale Wilsonville (Formerly Emeritus at Windfield Village) wasn't our first choice because it was a little more expensive, but we would've chosen them. They were very nice there, the food was excellent, and they had activities on every level. We choose Brookdale at Wilsonville for my mom because it has a really nice big room. The place is clean, and everybody is nice. The staff is great. There are a lot of lovely activities. They have bingo and games. They have people come in and perform. They do like country drives and take them to the different stores and different banks. They have cookie time and ice cream time. On Fridays they have wine, cheese, and pastries from around the world. I had breakfast and dinner there once, and it was fine. The food is good. Mom moved to Emeritus at Windfiled Village, and they are absolutely wonderful. I have nothing but good to say about this facility. It was a great transition for her. It was all kind of done really quickly, and they work with her. The staff is great. The activity's director and the involvement that they gotten her in was just wonderful. She is transitioning really well. Her apartment is clean. They have different activities, and they also have musicals. She is busy playing dice games. She is definitely getting more involved. I was able to eat there, and the food was great. Brookdale Wilsonville was very nice. The apartment was very nice and well taken care of. Everything in the building was well taken care of. The food was very good and the personnel was very helpful. We really enjoyed the visit. Helpful staff - pleasant aura - people seem content -clean interiorly & exteriorly, convenient to banking, shopping, medical facilities. Was our first choice to move too but two things concerned us: 1) Two bedrooms have just one small bathroom and no cottages. We'd need two baths. 2) Too long of a wait for meals. Gene is diabetic and its important to eat at scheduled times. We both prefer open dining. Brookdale Wilsonville is nice and has everything I need, but I've only been here for a month. The food is adequate. Sometimes it's good, sometimes it's OK. There are a lot of activities to do here and a bus that takes us places. The staff is very nice. I would have loved to have a door from my room that goes straight outside so I wouldn't have to go down the hallway and out the door, but I knew that when I moved in. 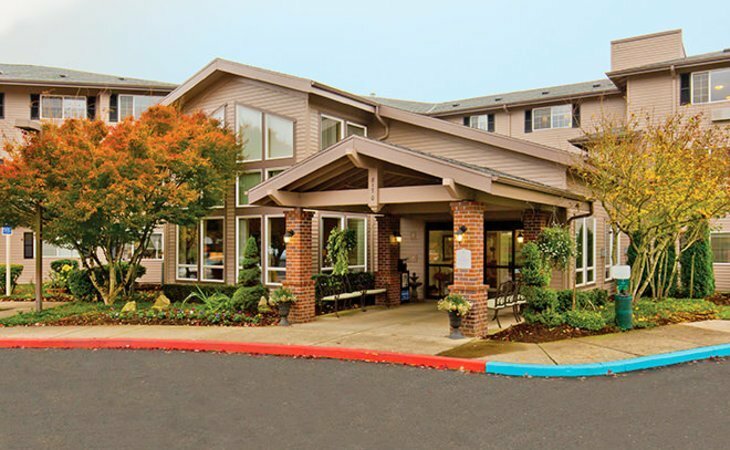 What should caregivers and potential residents know about Brookdale Wilsonville?